NASHVILLE, TN — Like a poke in the eye, Confederate monuments and statues have been bothering African Americans here for more than a century. There are about sixty of them in Tennessee. The first was a wall erected by Confederate soldiers in 1863 at Stones River in Murfreesboro. The newest is a monument to Freeman’s Battery of Nathan Forrest’s First Artillery in Parker’s Crossroads erected in 2002. 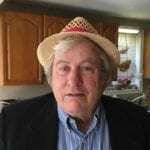 Edward Carmack – “What do we know about this man?” asks Historian Elizabeth Goetsch. Only recently have people called for the removal of Confederate statues from parks and public spaces. In 2013, the Memphis City Council changed the names of three parks from Confederate Park to Memphis Park; Jefferson Davis Park to Mississippi River Park; and Nathan Bedford Forrest Park to Health Sciences Park. 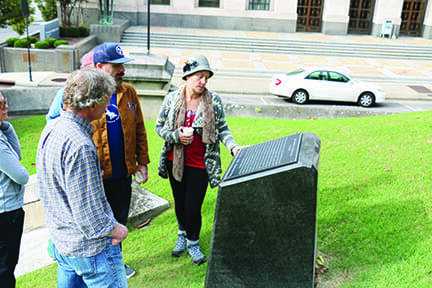 Two months later, the Tennessee Heritage Protection Act of 2013 became law. It prohibited “the renaming, removal, or relocating of any military monument…and includes streets and school names.” In effect, the law blocked Memphis leaders from removing a Nathan Bedford statue from the newly renamed Health Sciences Park and a statue of Jefferson Davis, President of the Confederate States, from the newly renamed Mississippi River Park. 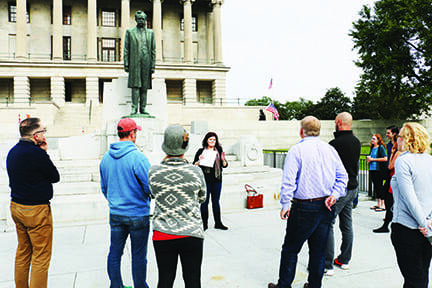 Memphis leaders are seeking a waiver from the Tennessee Historical Commission to relocate the statues but the process is deliberately difficult, requires a two-thirds vote of the 24-member commission, and the statues are still in place. The controversy pits those who feel the history of the South is about to be erased against those who feel it is wrong to publicly honor Civil War figures who thought it was not only okay to own other human beings but who also bought and sold them like cattle. One of those who did was Nathan Bedford Forrest. There is a larger than life statue of him astride a horse on I-65 South towards Brentwood. Forrest was in command of Confederate troops who massacred Union soldiers, many of them former slaves, who were trying to surrender at Fort Pillow in April 1864. After the war, Forrest employed black convict labor and became the first Grand Wizard of the KKK. Later he disbanded the KKK and renounced slavery. Since 2015 state leaders have tried unsuccessfully to remove a bust of Forrest in the state capitol. Both Governor Bill Haslam and Senator Lamar Alexander have called for the bust to be moved from a niche between the Tennessee House and Senate chambers to the state museum. The state Capitol commission rejected that plan. In August protestors rallied in the Capitol to call for the bust’s removal. It’s still there. The Times report went on to say that removing Confederate symbols is easier said than done. Six months after the Charleston murders, the city of New Orleans removed the first of four Confederate monuments from various spots in the city. The first was an obelisk honoring a violent uprising by whites against Reconstruction in 1874. Police protected workers who covered their faces to hide their identities. In May, defenders of the Jefferson Davis statue near the city center, some of them heavily armed, faced off against a multiracial group who taunted them. Five people were arrested. 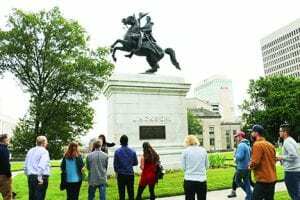 A few days later, about 150 white nationalists rallied at Lee Circle in New Orleans to protest the removal of a statue of Robert E. Lee. About 500 counter-protestors hectored them. Three people were arrested. The Lee statue was the last of the four statues removed to a private location on May 19. On August 14 in Charlottesville, Virginia, violence erupted when neo-Nazis and white nationalists rallied to protest the removal of a statue of Robert E. Lee from a city park. Three people were killed and 35 injured. It was the largest white supremacist rally in recent years and the bloodiest, the Times reported. Andrew Jackson – A war hero and later President, Andrew Jackson expelled some 16,000 Cherokees from Tennessee. Four thousand Native Americans died on the Trail of Tears in 1839.
assassinated in 1865. There is another of Andrew Jackson waving his hat astride a horse rearing on two legs. There is one of young Sam Davis who was caught with information about Union forces deployed around Nashville and hung as a spy in 1863. There are two small monuments set amidst the overarching statues on the Capitol grounds: one commemorates the millions of Jews who died in the Holocaust and the other, a granite cube on top of which is a plaque about the Middle Passage from 1444-1860. It describes the Atlantic Triangle that brought thousands of Africans to the Americas in slave ships. The monument was dedicated in July 1999. And there is one statue more prominent than all the others because it sits on a broad stone terrace below the Capitol’s main entrance and part way up the steps from Charlotte Avenue. It is of Edward W. Carmack, a politician and newspaperman who was shot to death in a feud with a rival about two blocks from where the statue now stands. He was an avowed racist, and when Ida B. Wells denounced the lynching of three black grocers in Memphis in 1892, Carmack publicly called for retaliation against “the black wench” for her coverage of the so-called “Curve Riot” in her paper, the Free Speech. Wells fled Memphis before her newspaper office was demolished by whites who wanted to lynch her. Wells did not return to Memphis for thirty years. The last laugh, however, was on Carmack. He had unsuccessfully run for Governor in 1908 on a Prohibition platform and was killed that same year. After his untimely death, prohibitionists turned him into a martyr and paid for a statue of him to be erected right smack in the middle of the steps leading up to the Capitol. Then in the mid-1950s, according to historian Goetsch, a lobbyist for Jack Daniels whiskey, convinced the state legislature to dig a tunnel from Charlotte Avenue under Carmack’s statue, leading directly into the Capitol building without having to see it.